I just published a video on the Evolving Ego YouTube channel. This is the first part of a series. According to my current outline, there will be 15 videos in the series, but that’s liable to change along the way. The series is an expanded version of my post from way back in 2012: “Stop Setting Goals that Don’t Make You Happy”. This was a post that many people told me helped them “see the matrix”. This diagram is my cheat sheet and will guide much of my future writing. 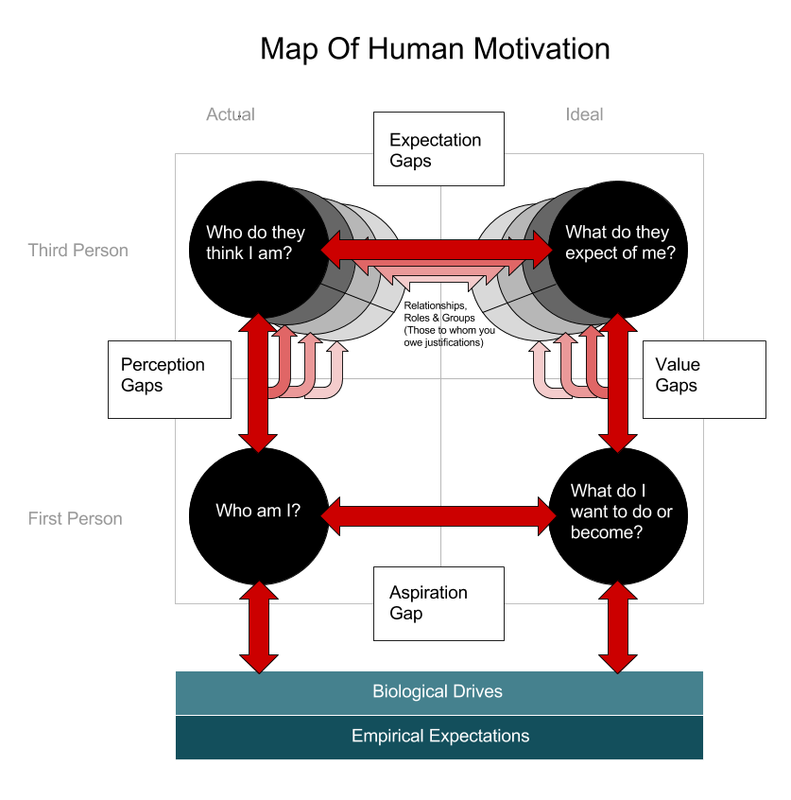 It should perhaps be labeled “Map of Self-Conscious Human Motivation”, suggesting there’s a whole other diagram for “other conscious” motivation. But this will do for now. I’ll provide some exposition over time. I present the gist in: “4 Portraits That Make Us Self-Conscious“. Some people prize individual differences, and focus on inter-personal interaction with others, regardless of which groups the other person belongs to. Others prize their group identity, and focus on inter-group interactions with others. In other words, one’s relationship with the other person will be heavily influenced by the relationship between that person’s group and one’s own group. Few people inhabit either extreme, and most will have a mixture of inter-group and inter-personal strategies for interacting with members of an out-group. But people can differ in the relative strength of each orientation. No doubt one’s degree of inter-personal vs inter-group orientation will be due in part to innate individual dispositions. But I wonder also if an inter-personal orientation correlates positively with privilege, and inter-group orientation correlates positively with oppression. If you aren’t being discriminated against because you are a member of a group, there’s less reason to identify strongly with that group. If members of your group are being antagonized by the members of another group, you are more likely to focus on the idea that you must stand or fall together as a group. If members of the out-group stop antagonizing your group, then your need to identify with your group becomes less urgent. And that might mean that members of your group will, likewise, spend less energy antagonizing their group. And the predominant interaction strategies will shift from inter-group to inter-personal. If all this holds, then there seem to be positive feedback loops in both directions. What does this mean for current political and social discourse?